This succulent grilled pork chop recipe features a mayonnaise mixture spread that will bring out all the great flavors of the pork - including cilantro, lime, and chile pepper for a little kick! 1 Combine all ingredients except chops in medium bowl. Reserve 1/2 cup mayonnaise mixture. 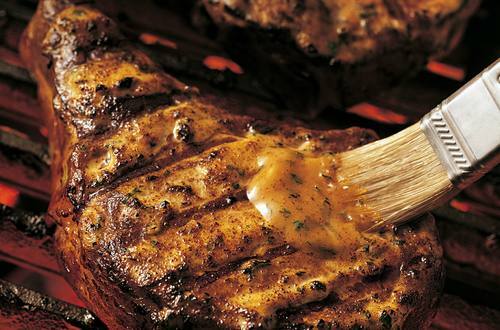 2 Grill or broil chops, turning once and brushing frequently with remaining mayonnaise mixture, until chops are done. Serve with reserved mayonnaise mixture. Also terrific with Hellmann’s® or Best Foods® Mayonnaise with Lime Juice or Canola Cholesterol Free Mayonnaise.